Soldiers of the People's Liberation Army. In November 2015, Xi Jinping announced an ambitious long-term reform plan for the Chinese armed forces. However, the idea of overhauling the People’s Liberation Army has led to resistance within the military, which sees the tried and tested Russian model delivering the goods in Syria. In 1890 China established its first modern military academy with plenty of fanfare – and German instructors – in the city of Tianjin. It led to the setting up of the “Self-Strengthening Army” in Nanjing in 1894. Made up of eight battalions of infantry, two squadrons of cavalry, two battalions of artillery and one battalion of engineers, it was uniformed and equipped in the style of the German Army. However, the German-modelled army proved to be a disaster when Japan handed China a resounding defeat in the 1895 Sino-Japanese War. Following the communist revolution in 1949, the Chinese modelled their armed forces on the Red Army. Right from its uniforms to equipment and military doctrine, the Chinese People’s Liberation Army – and its associate wings the People’s Liberation Army Navy and the People’s Liberation Army Air Force – was a clone of the Soviet military. Considering that the Red Army had destroyed over 300 German and Axis divisions with its innovative, lightning-quick manoeuvres during World War II, the Chinese had a good reason to go with the Soviets. It was a sensible decision because it allowed China’s ragtag guerrilla revolutionary army to be quickly organised as a unified fighting force. Between 1950 and 1969 – the communist bonhomie years – Soviet military equipment and advisors poured into China. Every facet of military life in the country was modelled on the Red Army. Even during the Moscow-Bejing rift, which lasted from 1969 up to the late 1980s, the Chinese did not discard that model. Media reports that an overhaul of the PLA would entail phasing out its Russian-style command structures in favour of a U.S.-style model are an oversimplification. For instance, one of the proposed reforms aims at moving away from an army-centric system towards joint command in which the army, navy and air force are equally represented. But this is hardly a western model; it is just the way modern militaries function and China has just been late to the party. As Russia has done in the last two years, the Chinese military seems to be primarily interested in shedding the accumulated flab of decades. The seven – defense oriented – military command regions are likely to be consolidated into four to help transform the world’s biggest army into a nimble force that is able to undertake offensive missions. Plus, the PLA will shed 300,000 troops, leaving it with two million personnel. Also facing the axe are 170,000 members of the officers corps. Predictably, the planned reforms have led to resistance within the military, with senior officials warning in military newspapers that the overhaul could destabilise the armed services as well as the wider society. In this backdrop, the Chinese Communist Party – which is dependent on the PLA to run the country – is unlikely to opt for invasive procedures that could mess with the military’s overall structure. A more pressing reason for reforming the military services is the challenge posed by the U.S. American warships are now a regular presence in the contested waters of the South China Sea even as the U.S. is sending bombers screaming into airspace China claims as its security zone. A nimble military with independent yet cohesive wings – army, air force, navy and perhaps a strategic forces command – is required to face the U.S., which is supported by Japan, Australia and several ASEAN nations. The American military has in the past few years transformed itself from an Atlantic focussed to a Pacific-centric force. Beijing has to keep in step. However, the Chinese are unlikely to model themselves on the U.S. military, which hasn’t exactly distinguished itself in wars in Iraq and Afghanistan. On the other hand, the impact of Russian military reforms is visible in the professional performance of its military in Syria. Russia has implemented far-reaching military reforms to create a more professional and combat-ready armed force that can swiftly deploy abroad. It started off by cutting the officer corps by more than 200,000. In Syria, Russia used military force outside the borders of the former Soviet Union for the first time since the end of the Cold War. “Its forceful intervention in defence of President Bashar alAssad made the United States look hesitant and indecisive, though the long-term impact of Russia’s gambit remains uncertain,” Gressel notes. If threatened, Russia can now overwhelm any of the countries in Europe, with NATO powerless to stop Russian forces from rolling through Europe. Russia’s successful overhaul of its once bloated military would be duly be noted by the Chinese brass. Indeed, it makes sense for Beijing to follow in Moscow’s wake rather than graft a western style system onto the PLA. Cracking down on corruption, creating a leaner fighting force by cutting numbers and establishing battle zones where the Chinese armed forces can execute strategic missions will be the Chinese military HQ’s prime focus. According to Beijing-based journalist Mu Chunshan, Beijing needs to create new regional commands like Russia's Arctic Joint Strategic Command, which was established in 2014 after the discovery of vast oil and gas reserves in the Arctic Ocean. In these aspects, Chinese military reform is long overdue, he says. "The last division of military regions in China was made in the 1950s; there have been no strategic adjustments for more than 60 years. 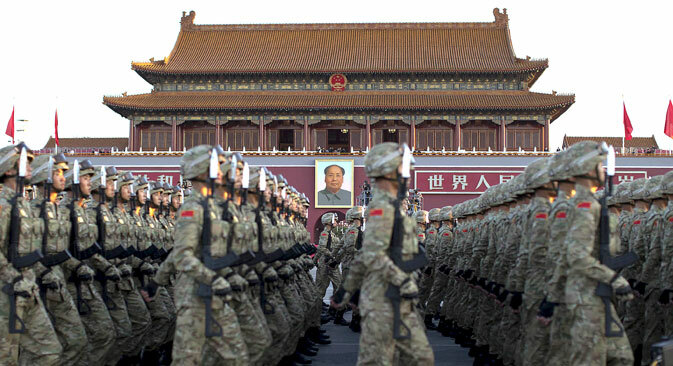 China’s military has not adapted to the modern era." In the meantime, China will continue to finetune its existing strategy of A2/AD or anti-access/area denial, which seeks to attack U.S. carrier battle groups in the Pacific and deny the American military access to coastal waters closer to China’s eastern seaboard. Again, that is a strategy the Russian Navy successfully employed during the Cold War. The good money is Beijing not moving away from its Russian military moorings in a hurry.